After I started to test my Mini Whip antenna I remembered that I own the Refcom FC-VLF converter. I didn't use that converter until today because I hadn't any antenna for low frequencies. But now I got my Mini Whip. 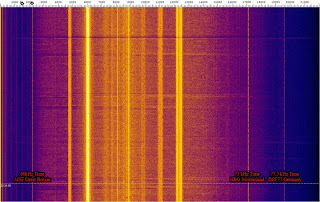 So I decided to connect the Refcom FC-VLF to my YAESU FRG-100 (in DRM mode ~10kHz wide filtering instead of 3kHz) and the Mini Whip to the converter. The Refcom FC-VLF sets the vlf frequencies up to 14,000 MHz. This setup works very well with fequencies lower than 400 kHz. With Mini Whip I can read from 10 kHz to 400 kHz. So I tested frequencies lower than 50 kHz (the YEASU FRG-100 itself can't get under 50 kHz without converter). 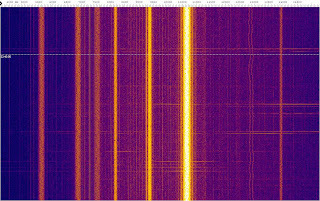 I tuned to 14,023 kHz and... Wow! It works!!! The Mini Whip is great for receiving vlf! I can't wait to get a cw signal from SAQ / Grimeton, realy.